If you are a sushi lover, but a bit on the conservative side, you may be in search of the best sushi making kit. There are several reasons why you may want to buy a sushi kit. The thing is, dining out can be really expensive and to get really good sushi, may require you to pay a premium price. If you have a sushi making kit, you can just prepare your own ingredients and subsequently make your own sushi when you feel like having sushi. The kit is also a good thing to have because you can also make your own sushi when you are entertaining guests at your home. 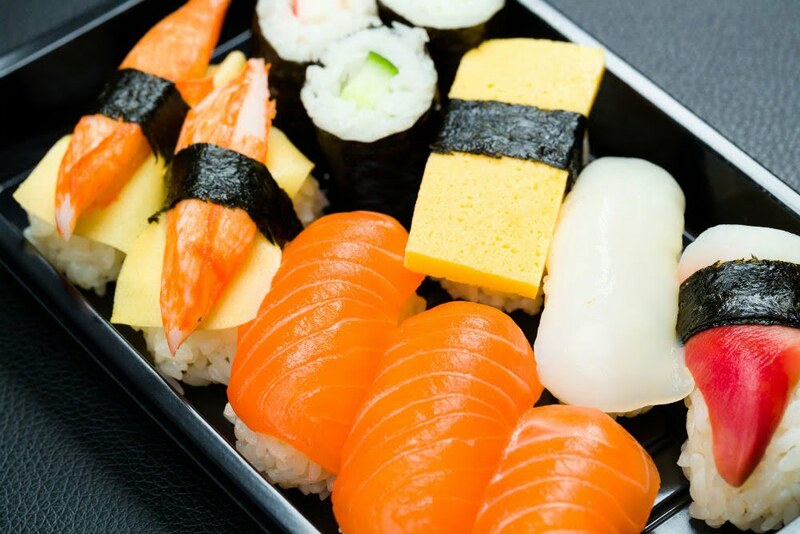 If you had a sushi kit before and you want to gift a sushi kit to someone, then this article will help you to decide on the best sushi making kit. 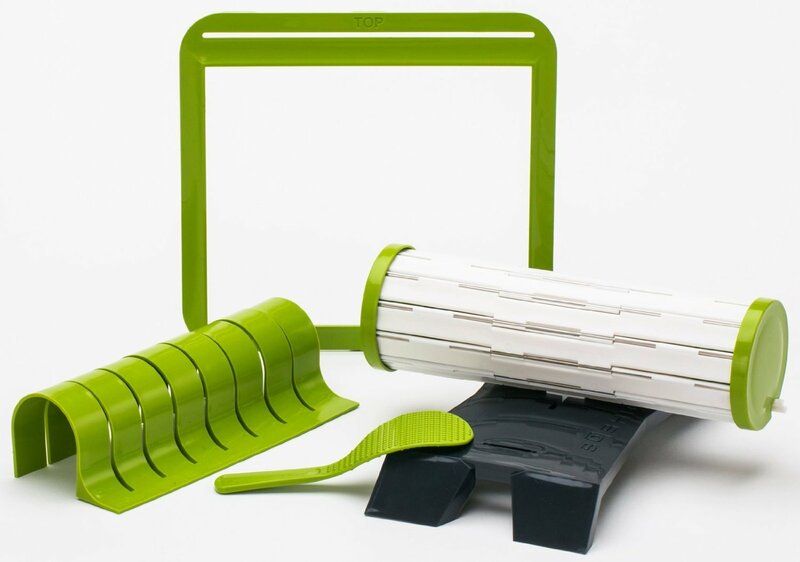 This sushi making kit, makes the sushi making process fun and easy. Imagine being able to make sushi in minutes. If that is your dream and heart’s desire, then you should seriously consider getting the Moxie & Co. Premium Quality Sushi Making Kit. The best part of this machine is that it will not break the bank and you can use almost any sushi making fish. It allows you to make gourmet sushi. If gourmet sushi making is your desire, then this is a must-have tool for your kitchen. You can use it to make your cake and fudge rolls, and the process of doing so is simple and easy. Detailed instructions and tutorial video. If you buy this kit, you can access a detailed instruction manual in PDF format and tutorial videos on the Moxie & Co. website. That way, you don’t have to worry about the device being too complicated to use. This sushi kit that is made from the premium quality material. You can trust that it is genuine and made with the sushi lover in mind. They also offer a money back guarantee. If you prefer your rice on the outside, then this kit is not a suitable option for you as it is only capable of preparing the rice on the inside of the rolls. Handmade sushi may look better. This is a machine, so the sushi is probably going to come out pretty standard looking. If that is not the look you’re going for, then you should probably consider making your rolls by hand and plastic wrap for variety. Don’t pack too many ingredients. If you pack too many ingredients, you may have problems with the clip when you try to close the tool. Sushiquik boasts that this is the number one sushi making kit in the world. If you use this kit, it provides you with one of the easiest means of making sushi for not just yourself but your entire family. Usually, by hand, the process can be really long, so if you use this kit, the process is easier and faster for you. After using the sushi kit, you can detach the sushi mat and put it in your dishwasher with other dishes. This adds to the easier component of using the sushi making kit. If you have a desire to make sushi rolls of different sizes, then this kit is for you as it facilitates that need. Not only that, but it can also make rice on the outside sushi rolls. This gives the roll an advantage over other roll kits. You get all the tools. Getting this kit means that you are equipped to make sushi. It comes with a sushi roll cutter, a non-stick paddle, and a training frame. It also has end caps which can be converted to sauce bowl and instructional guides. If has poor cutting guides. If has too many parts. If you’re used to the chef style sushi process and using knives, then all the parts that come with this set may annoy you a bit. 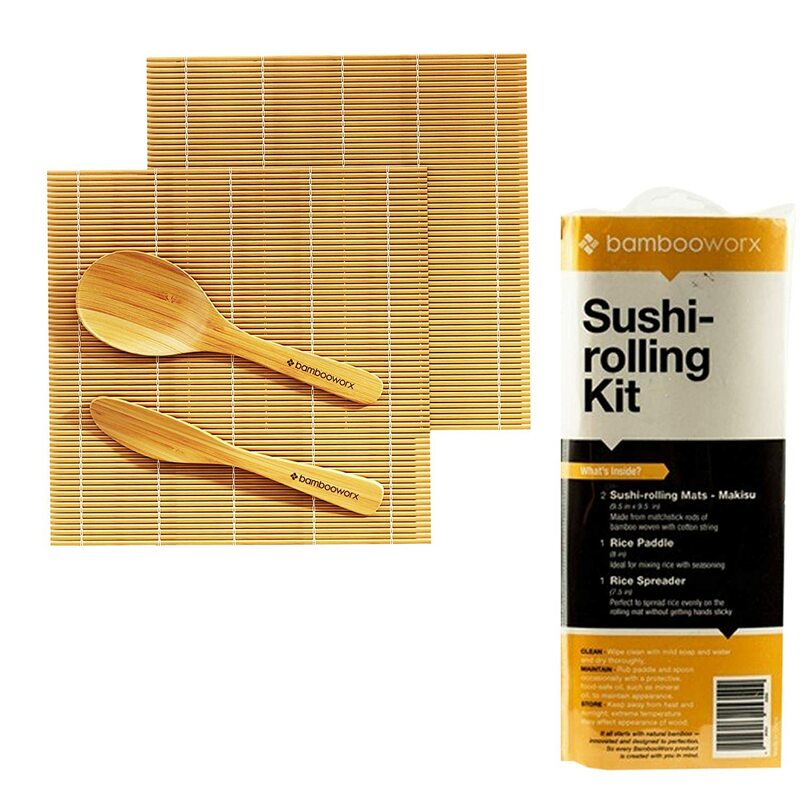 This bamboo sushi making kit comes with two fully bamboo sushi mats, a rice paddle and spreader for the ultimate sushi experience. It provides everything you need to make sushi in a simple, yet inexpensive sushi kit. It can be used by anyone from beginners to professionals, and it lets you make the dish in a few minutes. BambooWox has made the mat using 100% bamboo. So, this kit is a good kit for a naturalist to use. The kit was also crafted in such a way that you need not worry about splinters from the bamboo or that the stitching would unravel. The mat is made from bamboo. It is not stiff; in fact, it rolls easily. It is shaped like a square and measures 9.5 x 9.5 inches. This kit comes with picture guides that serve as instruction so you will understand how sushi should be made and how the rolls should look once you are finished. This sushi kit is not dishwasher safe. You are advised to wash the mats by hand with a soap and water solution and to leave the mats to air dry. The sushi kit needs to be cleaned frequently to maintain the appearance. To do this, you have to occasionally rub it with oil. Certain temperatures affect the bamboo’s appearance. Dry and heated temperature can affect the appearance of the bamboo so you ought to store it in a cool, dry place. All the kits seem to be a good choice; however, some of the sushi making kits are more expensive than the others. If you are looking at price and have a desire for a natural look, then the BambooWorx Kit is a good option. It is the cheapest on the list. However, if you want variety and the price is not an issue, you can go for the SushiQuik kit.